On Saturday 10th December, all TalkTalk TV customers will be able to watch Anthony Joshua defend his IBF World Heavyweight title against Eric Molina at Britain’s lowest price of only £14.95. 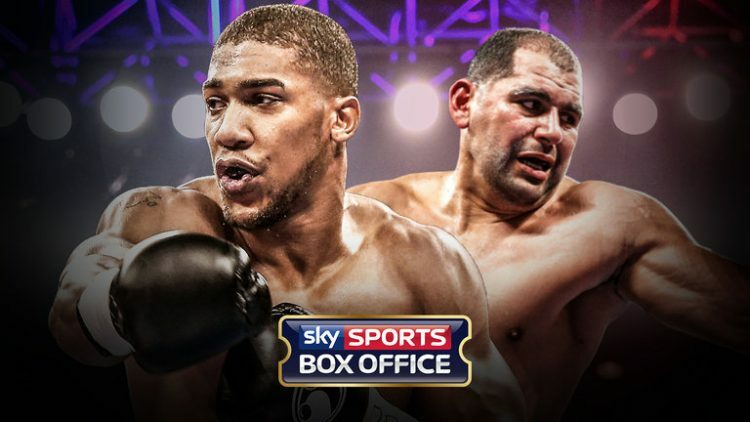 Viewers will be treated to a thrilling night of British boxing from the comfort of their own homes via Sky Sports Box Office on TalkTalk TV. The ringside action starts from 5:00pm and is available live on channel 416 for TalkTalk TV customers. British Olympic gold-medallist, Joshua, will defend his crown for the second time as he takes on his third American opponent in a row, looking to extend his 17 fights, 17 wins record. While the spotlight may be on Joshua and Molina, the night also offers an impressive undercard fight with Dillian Whyte going head-to-head with bitter rival and fellow Londoner, Dereck Chisora. Boxing fans will be able to relive every move with repeats at 9:00am and 4:30pm on Sunday the 11th December, while TalkTalk’s Plus TV customers can record the fight and re-watch the champions battle it out until 00:01am on 12th December. TalkTalk TV is offering access to more sport than ever before. Not only can boxing fans keep up with all the ringside action on Box Nation, all TalkTalk TV homes have access to every major televised football match – including all Premier League and UEFA Champions League fixtures – live on a single platform, through TalkTalk’s Sky Sports boost and through access to BT Sport. Viewers also have the choice to watch international cricket, rugby, Formula One and all four golf majors. Available for 30 days at a time with no ongoing commitment, TalkTalk TV’s boosts offer choice and flexibility at great value. If strength of schedule had anything to do with a boxer’s ranking, Eric Molina (25-3, 19 KOs), of Weslaco, Texas, might be rated amongst the top boxers in his division. Consider: In June of last year, Molina went to Birmingham, Ala., to challenge undefeated WBC Heavyweight World Champion Deontay Wilder (37-0, 36 KOs). Molina, a prohibitive underdog, lost but had his moments, including staggering Wilder with a wicked shot in the third round. This past April, Molina traveled to Poland and knocked out one of that country’s all-time great champions, Tomasz Adamek, in the 10th round. And now, on Saturday, Dec. 10, live on SHOWTIME, Molina will travel to Manchester, England, to challenge unbeaten IBF Heavyweight World Champion and hugely popular local favorite Anthony Joshua (17-0, 17 KOs). Once again, he will enter the ring as a significant underdog. “A lot of heavyweights haven’t walked the streets that I’ve walked through,’’ Molina said. “This is an evil sport. You lose, they write you off. It’s hard to bounce back like I have. Nothing has been given to me. I’ve earned it. I’ve done it the hard way. I enjoy the world underestimating me, but they don’t understand the struggles I’ve been through. “This is my second world title shot, my third major fight in 18 months, and I’ll be the first Mexican-American heavyweight champ in history if I win. I’m coming into this fight like this is it for me. This is my last shot. I’m ready to fight with everything I have. “I feel great about this fight. These are the kinds of fights I want and want to be in. Before I fought Wilder I had 35 days to train; for this I’ve had about five weeks. We feel this gives us plenty of time to fix what we have to fix in training. “This is a mission I set out for – to become the first Mexican-American heavyweight champion of the world. This is my mission. I’m looking forward to fighting Joshua and embracing the opportunity. I work very hard and put everything into it every day. I want to be the first Mexican-American heavyweight champion. What do you think of Joshua? Who are the top heavyweights in the world? How would you describe how your career is going? “I no longer second guess what I can do. Fighting on the road so much; fighters need that kind of experience to compete against a fighter like Joshua. You have to stay in the moment and keep focused at what you are there to do and not allow the atmosphere in the arena get to you. “I’ve fought some of the biggest fights on the road, so I’m accustomed to it and definitely think that is my edge over (Dominic Breazeale and Charles Martin). “Some fighters have to go down to become champion. It’s not that easy to become champion. My road sure hasn’t been that easy. I got beat by Wilder, but then I knocked out Adamek and now I’m fighting Joshua. When do you depart for England? What were your takeaways from the Wilder fight? “In the Wilder fight, look at the first knockdown. You see how I landed on my left ankle. I rolled it over and it hurt – and got worse — but I kept fighting. The ankle was in a cast for six-seven weeks afterward. “Take out the Wilder fight and it puts me in right in the mix with any heavyweights in the world. For me, that fight was confirmation that no heavyweight can just run through me. That is one of the differences between my attitude now and before. How do you rate the victory over Adamek in your last fight? Next boxing news: Final Hometown Fight For Harper?